The Kiefer Cottage: What's Vacation, Momma? I was 34 weeks pregnant with Winslow when Ryan and I got married. Since I was a little too close to my due date, and I was trying to save up vacation time for maternity leave anyway, we spent a couple nights at a local B&B and called that our honeymoon, thinking we'd make plans for a trip sometime later. 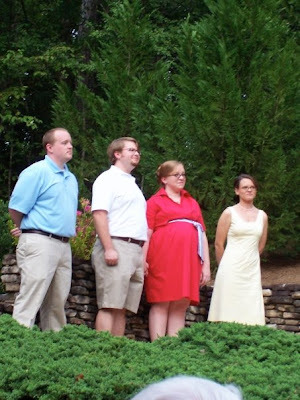 Hint: I'm the big bellied gal in the red dress. However, it's a tad harder to make vacation plans when you have three small children than when you're childless or have an only child. For some odd reason, the thought of taking care of a trio of little kids for more than a couple of hours scares people! But I have a gracious mother-in-law (and loving father-in-law), and so Ryan and I have committed to a trip for next year. We are digging through all the sofa cushions, cashing in our change jar, and diverting all odd-job monies as well as windfalls so that we can have a stress-free vacation and no worries about an excessive credit card bill greeting us when we get home. Sure, we could have spent that money on a new bathroom or on a tax-advantaged savings account, but we're looking at years without having a time to just relax. I mean, Ryan and I have never traveled together as a couple ever, and the time will never be quite right no matter what. We just had to pull the trigger. Plus, I have a fond memories of spending extended periods of time as a child with older relatives, so to give the kids a chance to experience the same is good in my mind. Luckily, the girls have already enjoyed extended visits in years past, so it won't be traumatic for any of us. Anyway, the details! We're going to the southern Caribbean, starting in Miami for a trek to Cartagena (Colombia), Aruba, Curacao, St. Maarten, and St. Thomas with Norwegian Cruise Line. (Side note: I couldn't stop thinking about Cartagena because of the movie Romancing the Stone. Ryan doesn't understand my excitement because he's never seen the movie. It's only one of the best movies of all time!) This is certainly travel-lite since the time spent at port will be limited. And there will be five full days at sea. But that's exactly what we wanted. No roughing it in the wild, no killing our own dinner*, no fighting off parasites like I've experienced on my own past adventures...Just lying around, stepping foot on solid ground a tiny bit, and otherwise enjoying each other's company without having to think about wiping bottoms or mowing the lawn. *I haven't actually killed my own dinner, but if you've ever watched someone (your host family) stop by the side of the road to buy a dried "grasscutter" (imagine a very large rat-like creature) and then endured their laughter while you try to be a good sport and eat it with gusto, then you feel like you can take the credit. Tastes like chewy chicken, by the way. Hooray for a vacation! Mike and I haven't traveled anywhere ad a couple before, either. We're planning on heading down to California after our wedding though since we'll be on the west coast anyway. Oh how exciting!! When are you going? I'm pretty jealous!